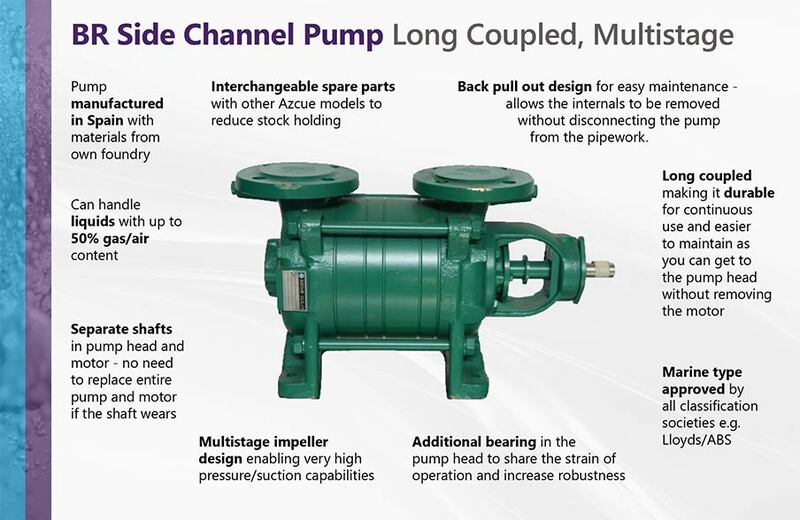 The Azcue BR Side Channel Pump is the long coupled equivalent to the MO close coupled pump. This is a larger, robust pump, multistage in design, which gives it very high pressure/suction capabilities whilst having low flow. This makes it ideal for applications such as pressure boosting and water supply when there is quite a lot of demand on the supply at a time. By nature, these liquid ring pumps can handle up to 50% gas content, making the BR side channel pump ideal for condensate extraction. These Azcue pumps have two separate shafts in the pump head and motor meaning that if there is an issue with one, there is no need to replace it all; a benefit over alternative brands that have one continuous shaft from head to motor. For more information on the working principle of side channel pumps, view our guide here.